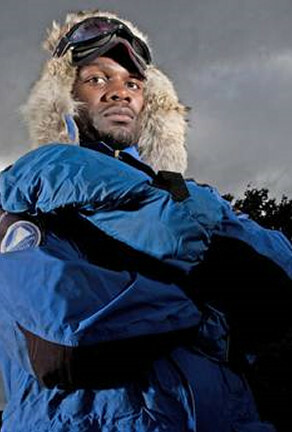 In 2010 Dwayne Fields was the first young black Briton to walk 370 miles to reach the North Pole. Born in Jamaica, Dwayne grew up in the UK from the age of 6. He has been the victim of both knife and gun crime and as a result of his experiences of the effects of gangs and crime, he decided to change his life. He became an adventurer/explorer, completed a combined honours degree in Psychology, International Development and Business Management and spent three years as an electrical mechanical engineer for London Underground before following his passion and raising funds to reach the North Pole. In 2013 Dwayne was awarded the Freedom of the City of London. As a naturalist Dwayne also appeared as a special guest on BBC’s SpringWatch Unsprung with Chris Packham, where he explored the wonders of the British Countryside. Dwayne is an Ambassador for the Scouting Association and currently works with young people in inner city areas. Dwayne is a force to be reckoned with and is currently planning his next adventure.